I just ran across a great resource for anyone interested in golf course management and maintenance. 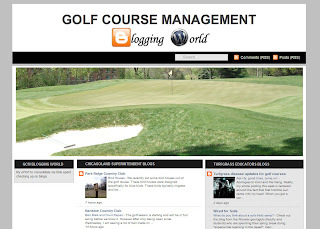 Golf Course Management Blogging World will save me the trouble of having to search for all of the blogs out there and "Follow" them. Not only does the site list a lot of resources, but it contains a snippet from the blogs' latest post. Thanks to whoever put this together -- I couldn't find the author mentioned. This will save me a lot of time. Instead of making sure I'm following all these blogs with a newsreader, I'll just check this site. There are two other handy lists of golf blogs that I use frequently. They are a great source of real world information about golf course maintenance and management. Do you want to know how greens are maintained at various courses? Wondering about course conditions in a certain region of the country? Ever think "How did they do that"? I know I have. These sites are a great place to find the answer. BASF Turf Talk's "Blogs We Like" is a very complete list of superintendent blogs. I have clicked through it many times and learned something every time. Golf Course Industry magazine's "Blog Central" also contains links to a wide variety of golf course related blogs from superintendents, architects, and builders. Thanks to all of these sites for including Sugar Creek! Excellent. I follow your blog through an RSS reader. This will be a great service for me. Keep up the good woek.